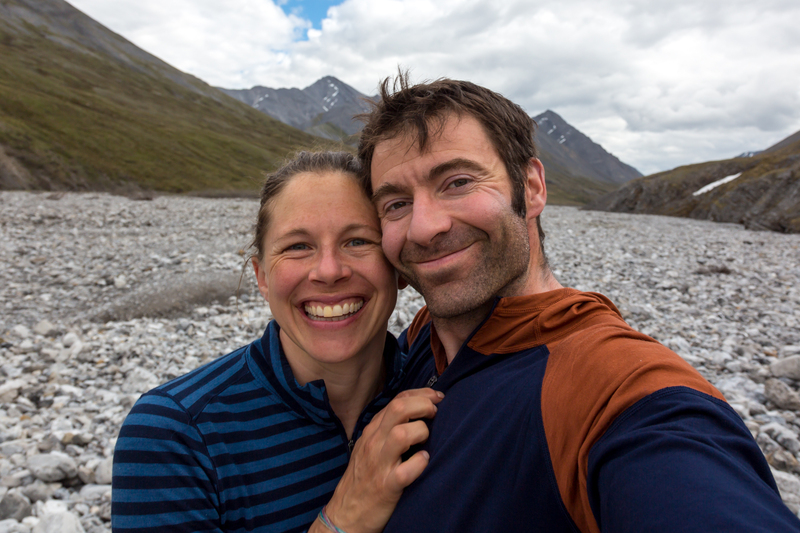 In June of 2017 Sarah and I hiked and floated through the Arctic National Wildlife Refuge, the second leg (of three?) 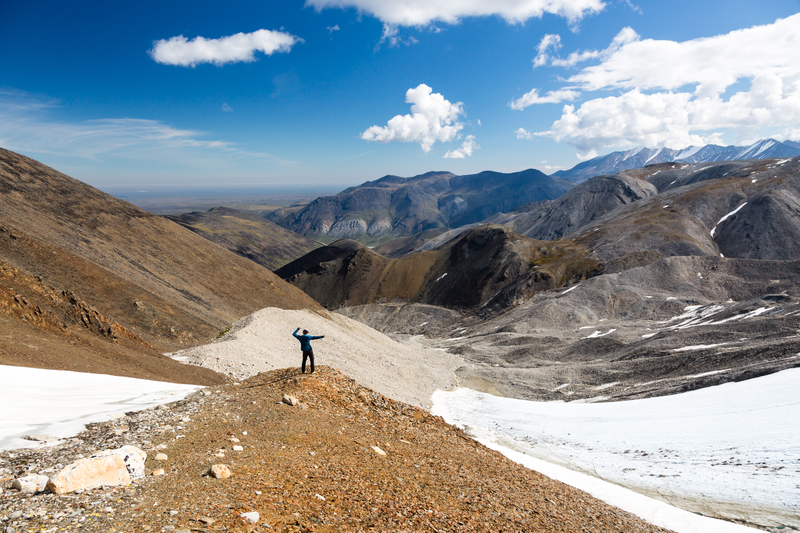 of our Brooks Range Traverse (2016: Gates of the Arctic National Park). The huge advantage of going to an ‘established’ route was that we got logistics help from friends in the area. 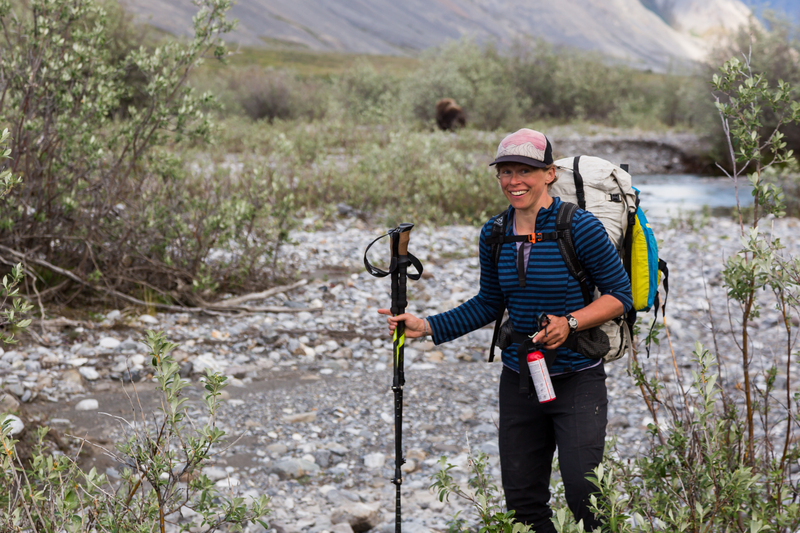 We shared Will Koeppen’s route plan and food drop, Ed Plumb and friends sent messages with conditions at the Okpilak hot springs and river, and Marlena Renwyck and Sarah Tingey cached food for us before they floated the Hulahula River. After a night in Wiseman catching up with the Hickers, Berni and Uta gave us a ride to where the Atigun River pulls off the Haul Road toward the Sag River. We used route advice from Paul Schauer and Gabriel Gersch, opting for a longer and more mountainous route to reach the Ribdon River. 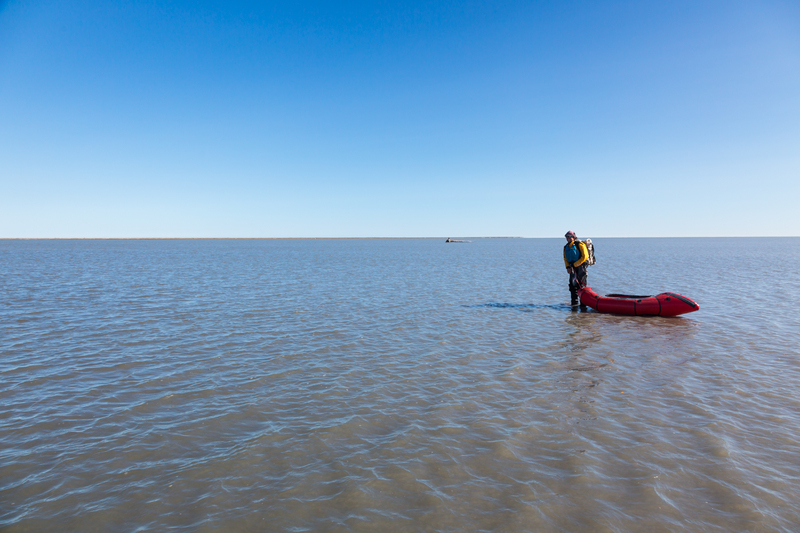 We caught Will Koeppen, Shannon Kuhn, Brian Olsen, and Catherine Bodry on the Marsh Fork, and travelled together to the landing zone where Brian and Catherine flew out. Sarah and I had been shooting dance video clips, and Will and co. were happy to bust out some Public Land Dance Heist moves. We ran into Moe Witschard, Rick French, and friends, at the landing strip, and convinced them to dance too. After packing our new food supplies, Sarah and I hid in the tent for a three hour thunder and lightning storm, the only serious rain we had in three weeks. 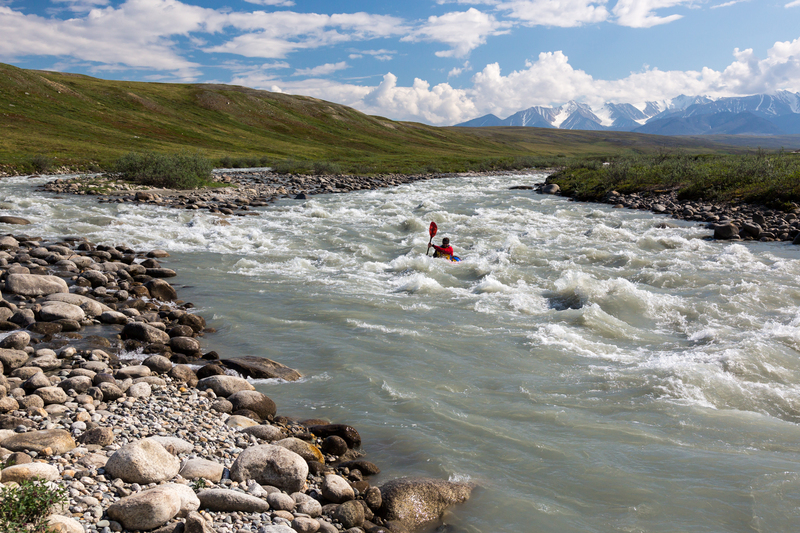 Will and Shannon started their Marsh Fork float, so we didn’t see them again until back home in Anchorage. Sarah and I stayed higher in the mountains, planning to cross the continental divide twice and then drop into the Hulahula River headewaters. 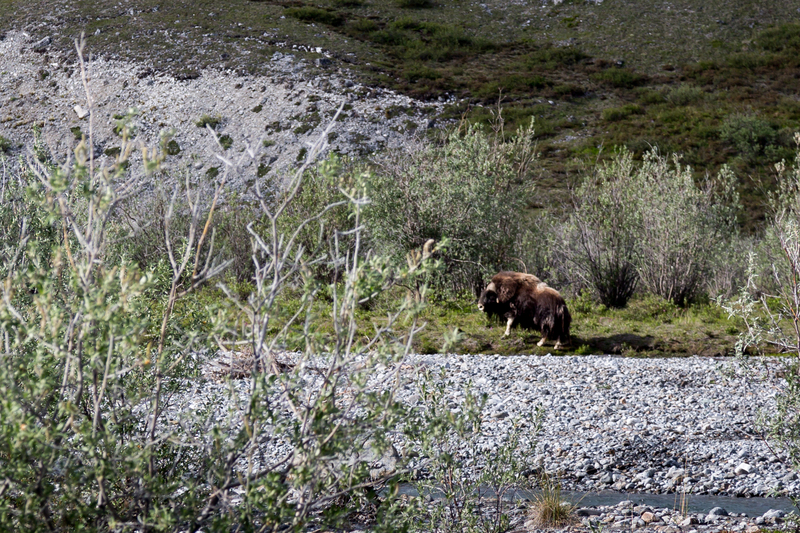 As soon as we crossed the Wilderness boundary, we saw a lone Muskox. Sarah collected some qiviut for her mom. 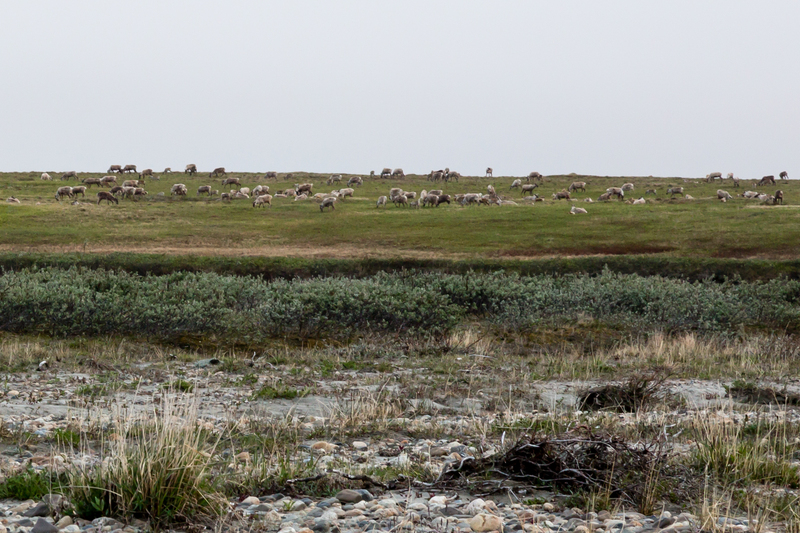 We also saw sheep, ~50 caribou, and 1 grizzly in this section (we’d seen two grizzlies before reaching the Marsh Fork strip). 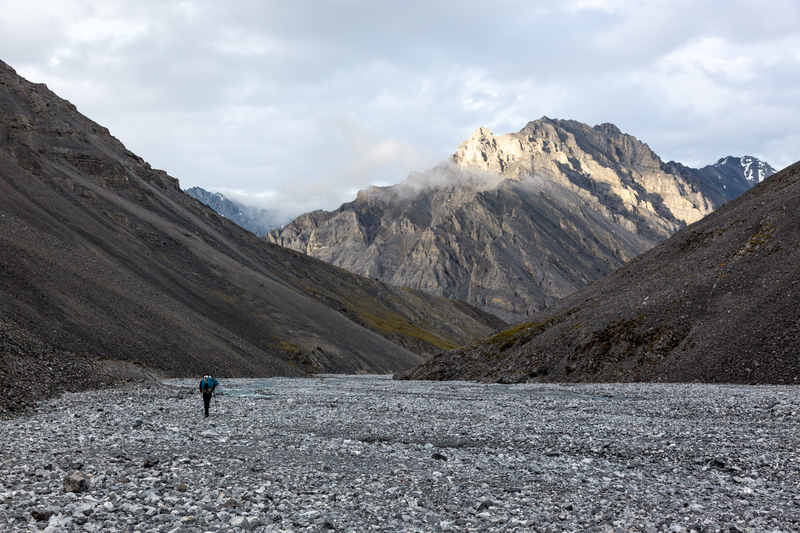 Our hardest day, the “Cont-en Divide,” was a 12 hour push to reach the headwaters of the Hulahula. The first surprise was a waterfall that made it obvious we couldn’t simply hike the creek bed to the pass. Skirting the fall was easy, and we had to skirt a few others, before taking snow up to Cont-en Pass. 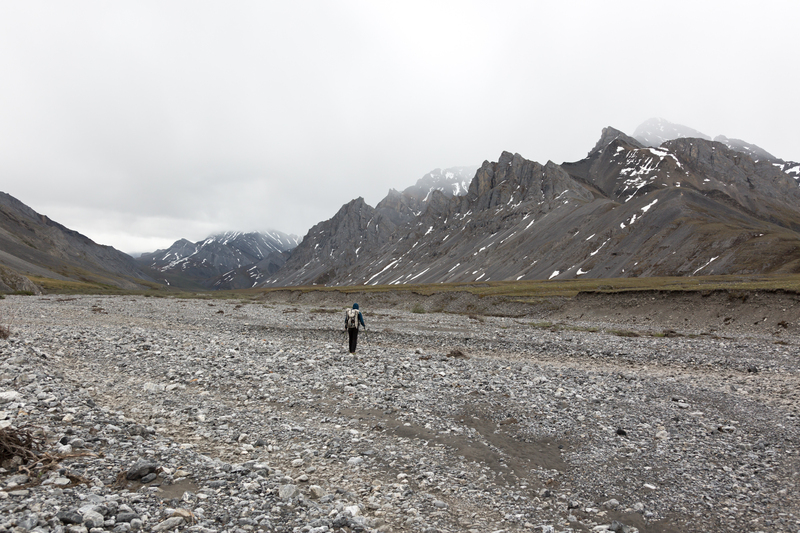 We had been following caribou tracks, but they completely disappeared before the pass, which made me nervous. The valley walls were lined with steep limestone cliffs, only the pass was loose rock. From the pass, we couldn’t see any sign of animals, which made me even more nervous. I was prepared to get cliffed out or find a huge waterfall, and it was already 7 PM or so. 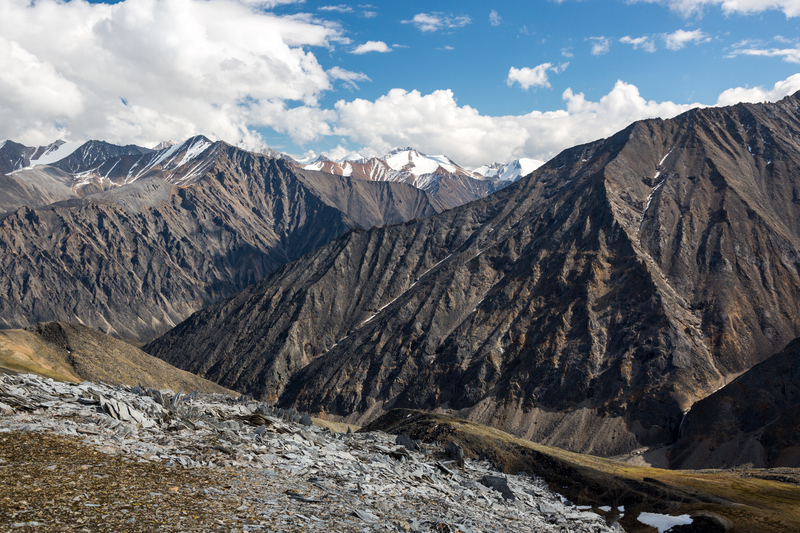 On the north side of the pass, We slowly picked our way down the very young moraine (there was a tiny bit of glacier ice exposed too), and had to climb around three canyon sections. Camp options weren’t ideal, but even if they were, we were both motivated to get this section of unknowns behind us. We kept hiking, past 10 PM, through gray rocks, under gray skies, everything eerily still and quiet. 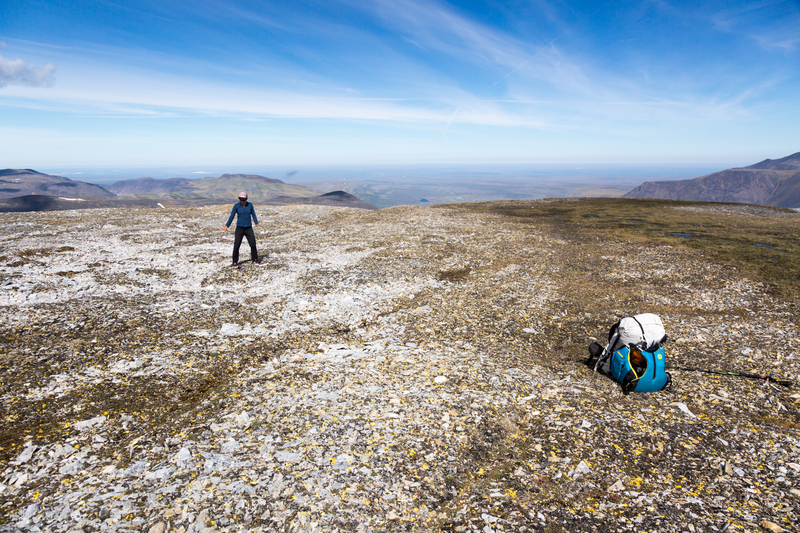 Finally we reached a grassy ridge and saw game tracks, a huge relief. I sang a joyful song that went something like, “Poo, and bones! Poo, poo, and bones!” We moved a few more miles down valley to an open confluence of three (dry) tributaries, just wanting to be in open space after feeling pinched in all day. I didn’t do a good job of getting pictures to document this part of the trip. At this point I was surprised to discover that we weren’t on the upper Hulahula. We were on a major tributary, but the Hulahula was labelled as an eastern tributary on the map. Our tributary had good walking, but not enough water to float. 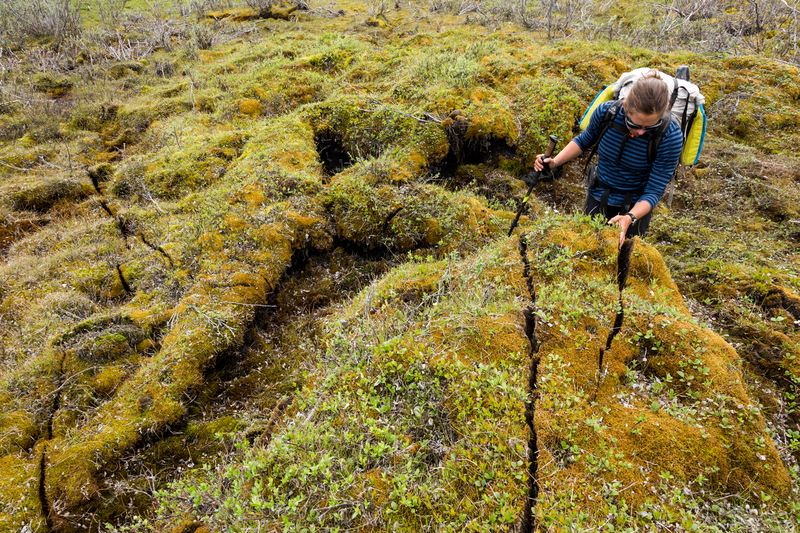 So we walked nearly all the way to the Grassers landing strip, enjoying the increasing greenery, and some cool permafrost cracks in the vegetation. We found our cache (from Marlena and Sarah T.) and started to float the Hulahula. The water was clear, low, but with enough water for some fun boating. 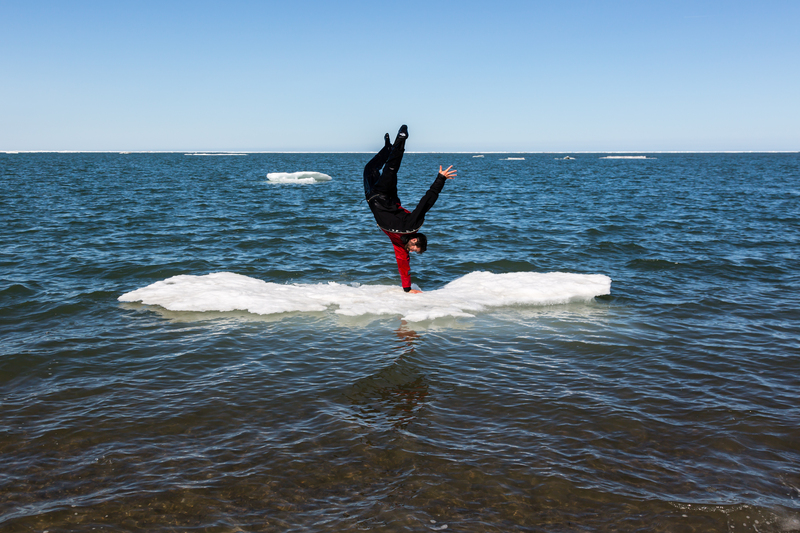 There were a few splashy waves, but nothing technical. 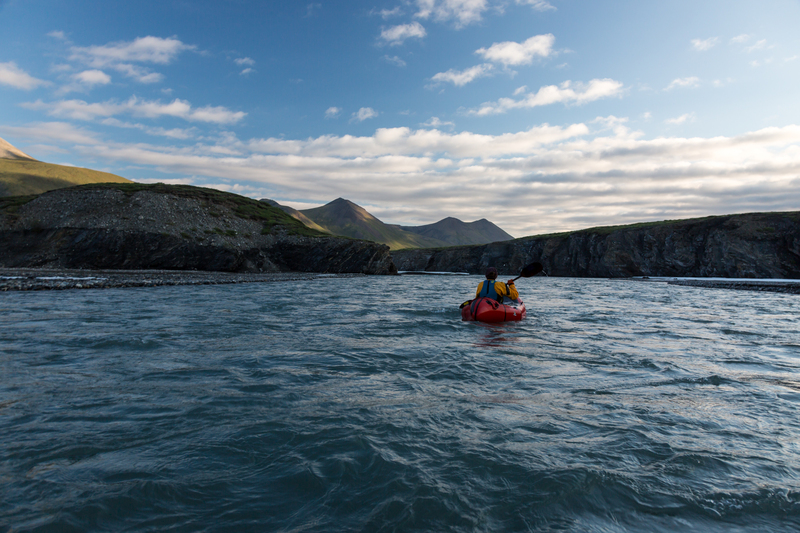 We had a strong headwind the first day, strong enough that we pulled off the river, set up camp, and woke up in the night to float without the wind. During the night we paddled through two cool canyon sections and a really fun boulder garden. If this is representative of what happens lower on the Hulahula, I’d like to head back. But we wanted to jump over to the Okpilak hot springs, so we pulled off the river at 7 AM, cached some food for Will and Shannon, and crawled in the tent. The whole point of going to the Okpilak was to check out the hot springs. 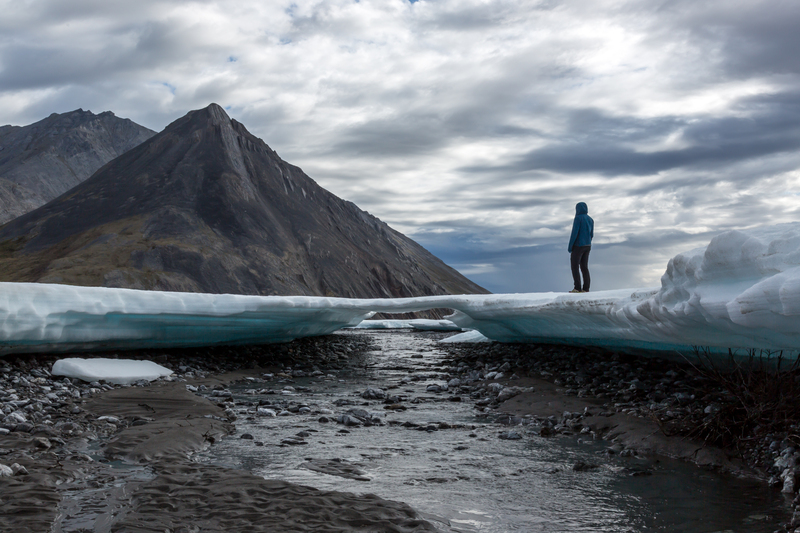 We walked on glacier ice and dipped in hot springs on the same day, which I thought was really cool. Overall, the springs were too hot for me, and too buggy unless there was a breeze. I was wishing I had visited in the winter. But we took several dips and it felt great to wash our bodies and clothes. Any disappointment in the too-hot springs was made up for during the Okpilak River float. The river wasn’t as clear as the Hulahula, but the gradient was excellent, 6 miles of braids before a 10-15 mile section of continuous class III rapids. 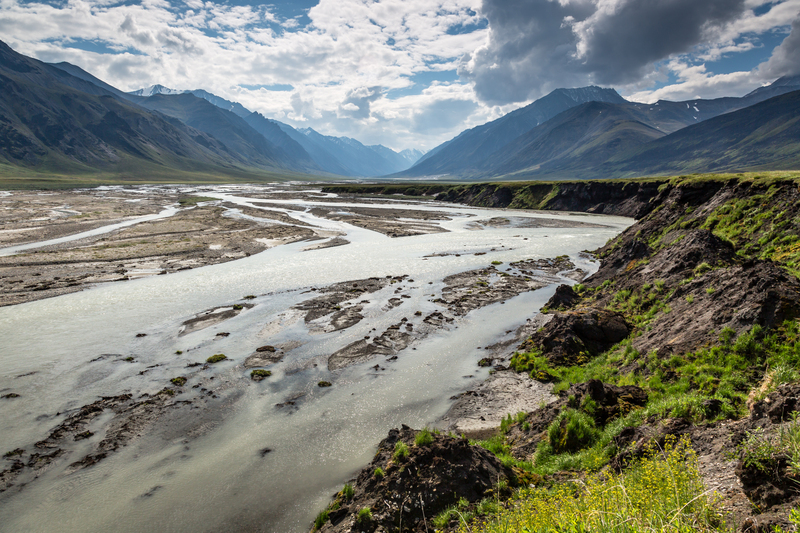 I loved the non-stop action, and we saw a wolf and several caribou on the banks. After 40 miles or so, the gradient decreased, but the current was still fast enough to feel like we were making good time. 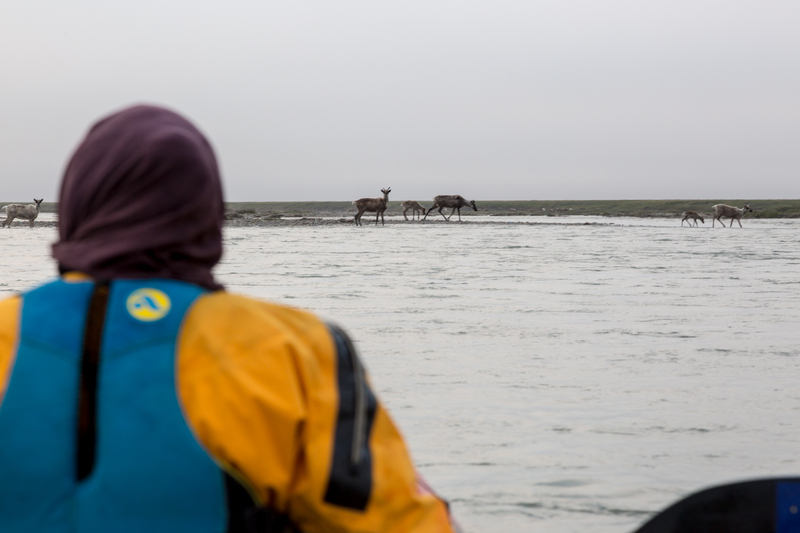 During our second night camped on the river, I got out to pee (around midnight) and thought I could see a few hundred caribou down the river. 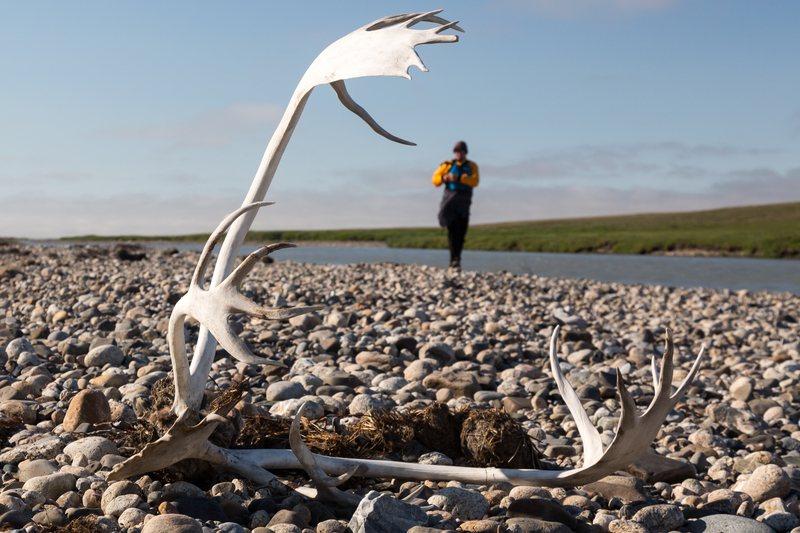 We packed up camp and floated down the river, passing what turned out to be a few thousand caribou. It was an amazing experience. Friends had floated the Hulahula during the night in June of 2016 and described floating through the herd, but I didn’t think we’d be as lucky. We didn’t stay long, sensitive to making them uncomfortable, though they didn’t seem disturbed. 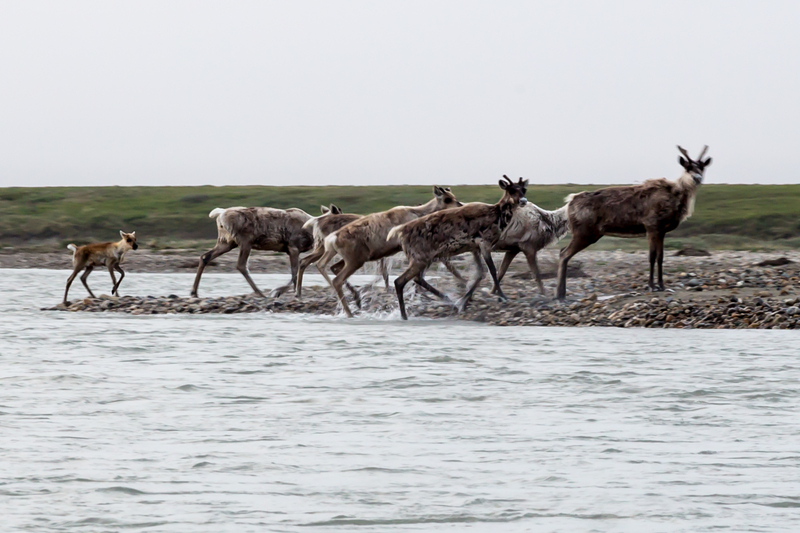 Seeing this group of caribou completely changed my appreciation for the north slope. 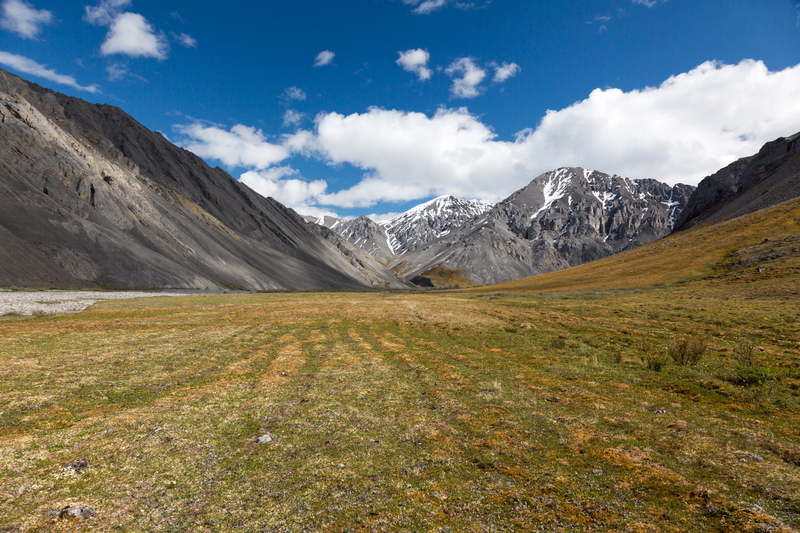 Before the caribou, it had felt like a cool, novel, landscape, but kind of featureless. 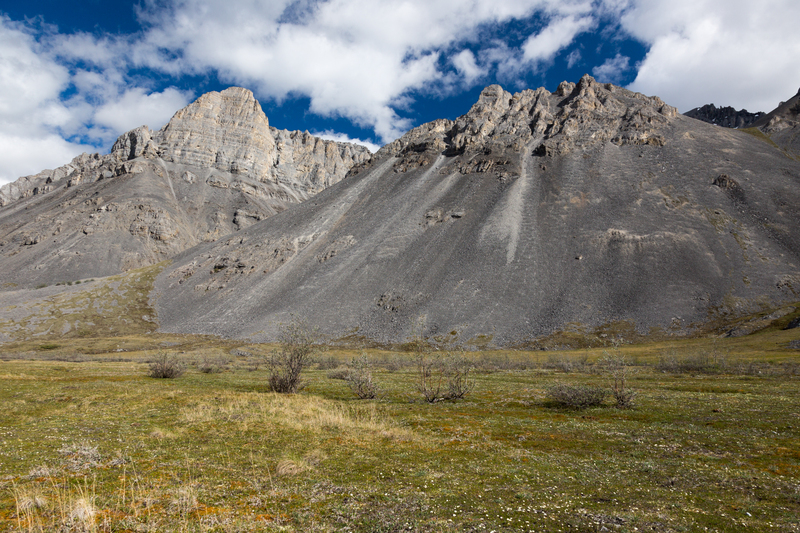 Adding a few thousand caribou in their breeding grounds, I instantly had more appreciation for the value of the land as a refuge. The next day we finished our float and camped on the edge of Arey Lagoon. 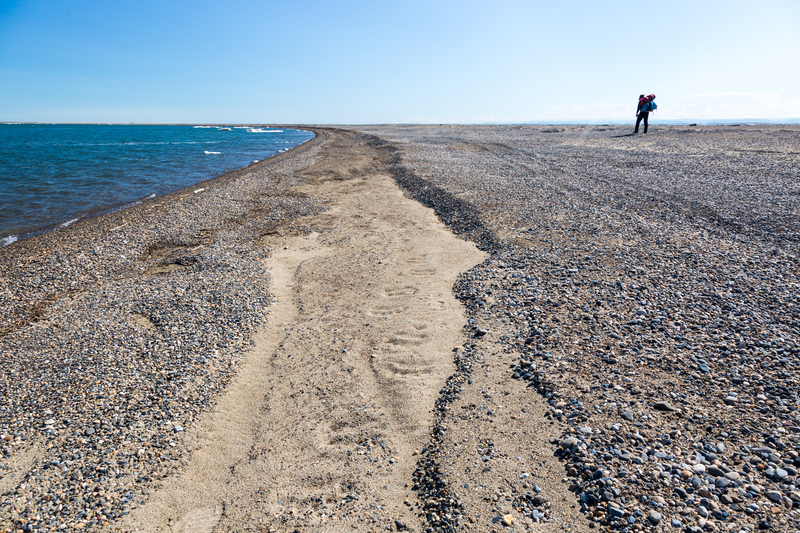 We spent a lot of time discussing whether to walk the mainland or cross to the barrier islands to reach Kaktovik. 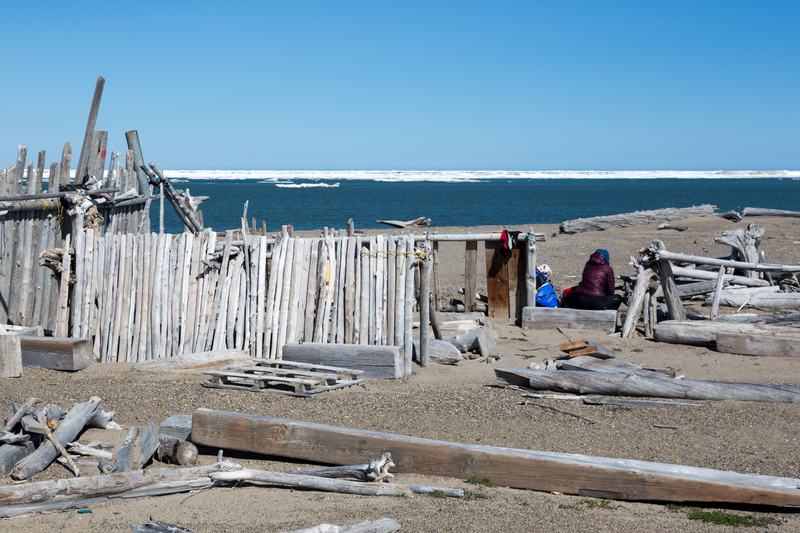 Each of the other groups (Ed, Will, Sarah and Marlena) had walked the mainland because there had been too much sea ice for the island route. But now the island route was clear. 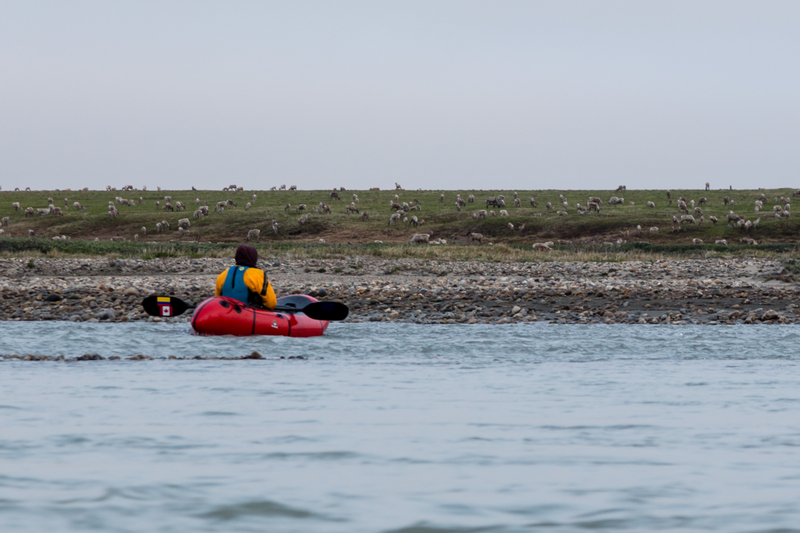 We were nervous about being the first people to take the island route this summer, nervous because of polar bears. 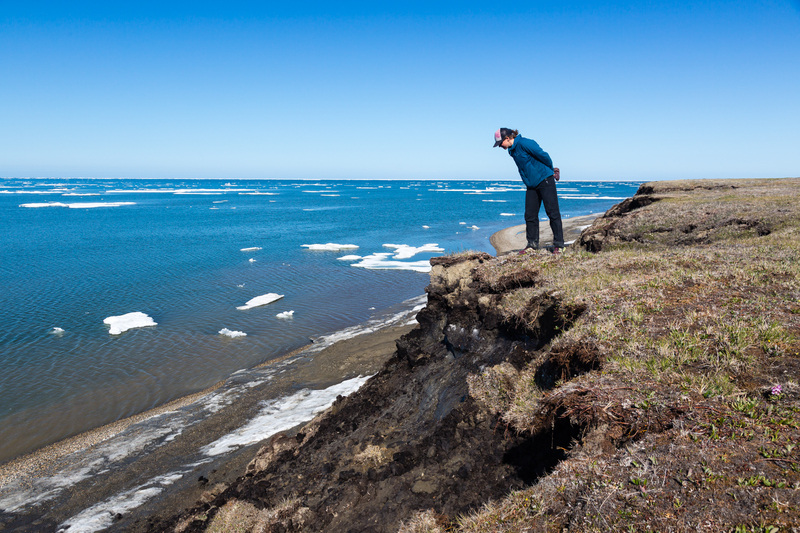 Ed had been told that 8 polar bears and cubs were in the area, and Sarah was told that two bears had been seen two weeks ago. I really wanted to try the islands, arguing that I was there to collect as many experiences as possible, and the islands looked unlike anything I’d seen. So we did. The crossing was about 1/4 mile walking on firm mud, eventually ankle deep in water. Then we paddled half a mile accross the lagoon to reach the islands. 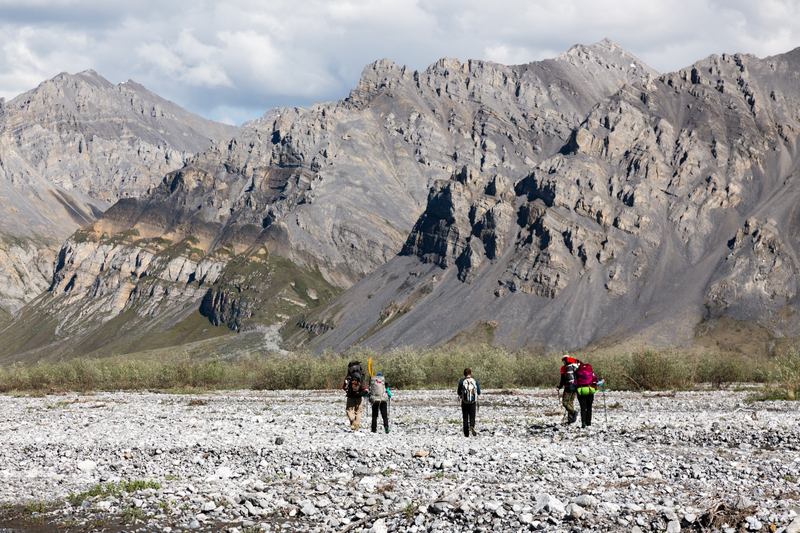 We looked around for bears, then packed our boats and started walking east on the gravel. We saw one set of polar bear tracks (heading west) but no bears, which was fine with us. 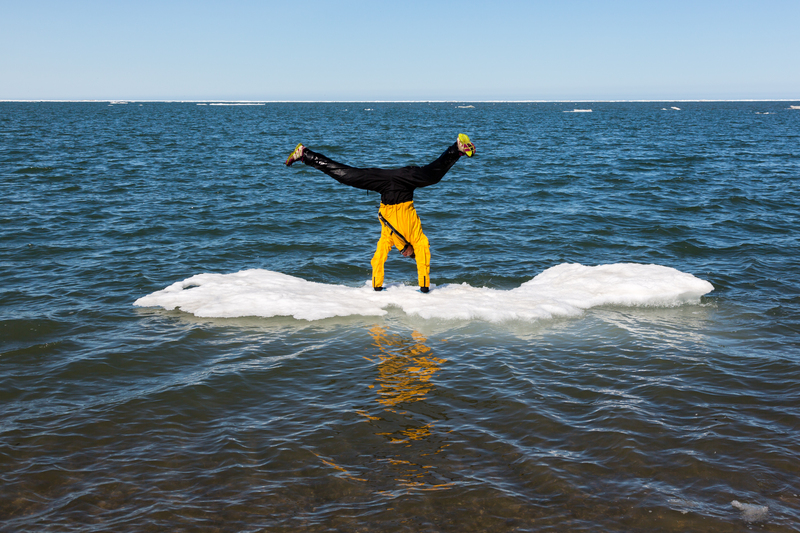 By the end of the walk we were feeling comfortable enough to do some iceberg dancing. 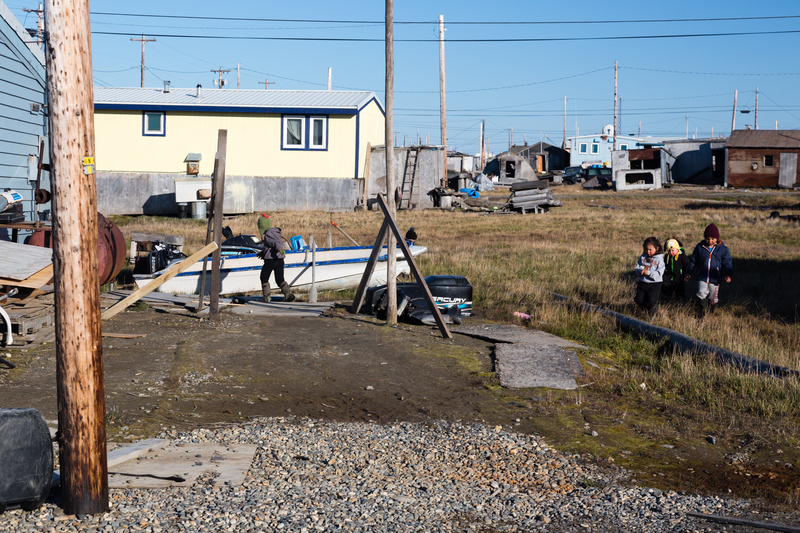 We received a warm welcome in Kaktovik, and regretted not planning to spend more than one night. I was impressed with how clean the area was and that everyone seemed to be out fishing. The folks at Waldo’s Arms gave us reports from our groups of friends that had come through earlier in the week (Will, Ed, Sarah and Marlena, Roman and Brad). I was hoping to hear from villagers about their thoughts on oil development, but didn’t find a way to bring it up. The dependence on subsistence hunting and oil for transportation and heat make for a really complicated relationship. I really enjoyed Tom Kizzia’s New Yorker article about this relationship in Point Hope. 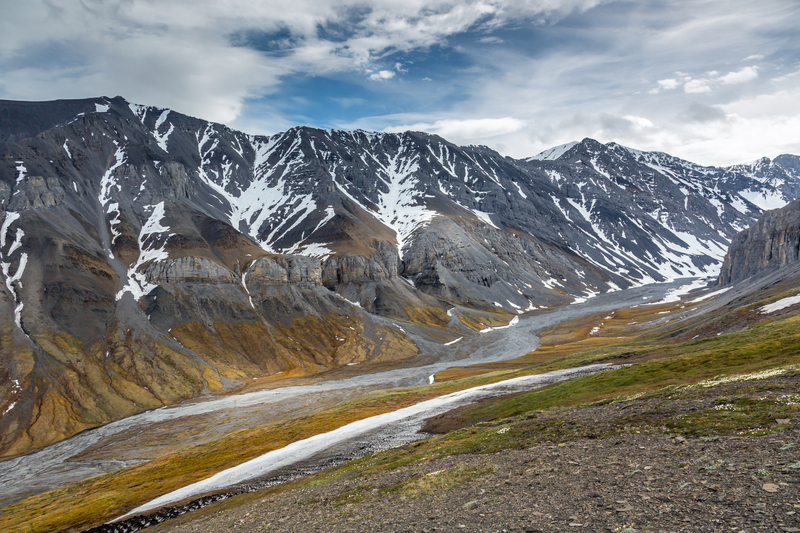 I’m kind of holding my breath to see what happens to Alaska’s mineral-rich public lands. 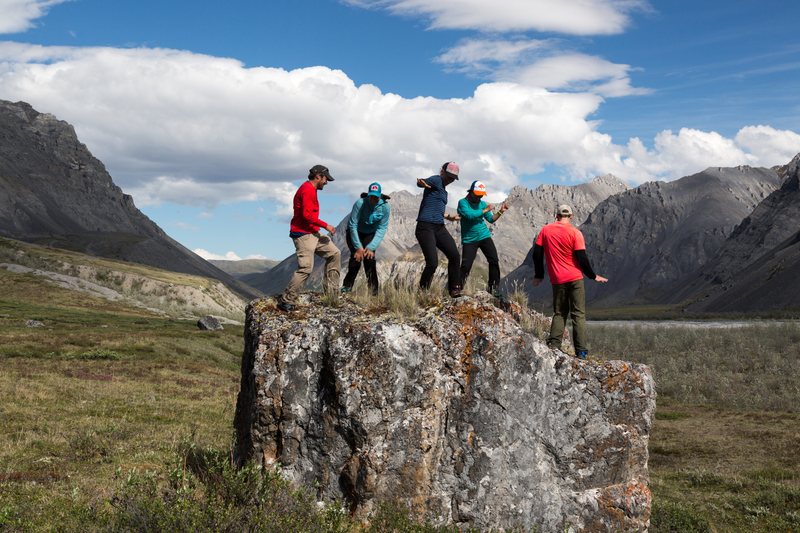 The dance video is an effort to showcase the amazing landscape, in an inclusive way that shares the fun and value of that land as wilderness. Wow, what an amazing journey you took. I can only admire your trailblazing and heroics to make this trip. Many decades ago I was fortunate to raft the Hula-hula with Wildlife Birding(?? 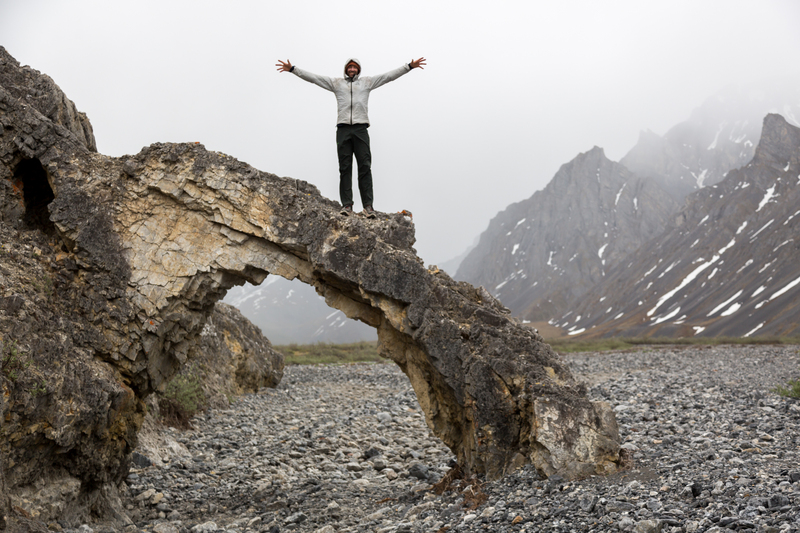 from Alaska) and loved every minute. So reading about your adventure meant so much to me. We were on a luxury cruise in comparison to what you have done. Thanks so much for sharing this story with us. My wish is that your tale could be shared with the entire country on PBS or some, such venue in time to save one of the last and most remarkable places in USA.